Are you an American or other non-EU citizen looking for a way to live and work in the EU, but cannot get a residence or work permit? Because only EU citizens have the right to live and work in Europe without restriction, the easiest path to living and working in the EU is to claim EU citizenship through descent or origin should you have an ancestor born in one of the current European Union member states or non-EU countries of Iceland, Liechtenstein, Switzerland and Norway. Many times, there are no language or residency requirements, and applications for repatriation are processed quickly. 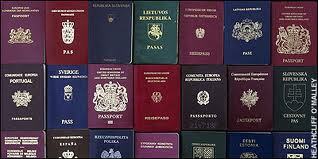 Citizenship from an EU country would then entitle and allow you to apply for an EU passport and national ID. 2) By living in an EU country legally with a residence permit and going through naturalization. If you are married and/or have a child with an EU citizen, all legitimate non-EU spouses and minors of EU citizens are entitled a residence/work permit, which essentially grants the same rights and privileges as an EU resident. You may also be eligible for a shortened waiting period for citizenship by naturalization, but there are almost always language and in-country residency requirements. There is no automatic way of getting EU citizenship through marriage due to fake marriages, bribery and fraud. Thus, there is no such thing as marrying for EU citizenship. Please be aware that all countries still recognize citizens by nationality, i.e., Belgian, Greek, Spanish, British, etc. The EU has not fused into one big country, and there are no one-size-fits-all rules for the whole of Europe. The EU is a collective made up of separate member states (countries) — much like the United States is a country made up of separate states such as California, Florida and New York — with each retaining its unique borders and laws. If you do not have an ancestor or spouse from the EU, see other options for EU citizenship and living and working in the EU by clicking, “How to get EU citizenship, passports, visas and permits to live and work in the EU” if you have not already read this article. *Article last updated on October 28, 2014. Waiting for resolution to three plagiarism claims. It is imperative you consult directly with an official government authority in your homeland regarding your country’s stance on dual nationality or dual citizenship with the target EU country before starting this process. If you do not, you risk getting misleading information and possibly losing your current citizenship. Certain countries allow it, some don’t. If you are already an EU citizen, seeking dual citizenship with another EU member state is redundant and carries no real benefits in theory. In reality, however, some EU countries do show preference toward its citizens even though it goes against EU directives. Should you have questions, you must consult directly with an official government body, such as the consulate or embassy in your homeland, or the appropriate government ministry in the country of concern. Do not consult forums, a friend or relative or lawyers advertising citizenship services on the Internet, or you risk being cheated of time and money, in addition to getting damaging advice as each case is unique. Be aware that citizenship applications may only be offered in the native language of the country concerned, even if they do not require applicants to be fluent. Greece – “Greek citizenship by claim or Greek origin, ancestry, descent,” and “Ways to get Greek citizenship” and “Greek citizenship by naturalization” (articles based on official documentation/real-life experience). Official site has old and very outdated Greek Citizenship Code (in English). Hungary – Hungarian citizenship and passports, Hungarian citizenship by naturalization, ancestry and other cases, About Hungarian citizenship and Hungary Act of Citizenship. A law passed on May 26, 2010 allows people of Hungarian descent to claim citizenship without living in Hungary, but candidates must speak Hungarian. Netherlands – How to acquire Dutch nationality/citizenship, Obtaining Dutch nationality by option or naturalization, Do you want to be Dutch? Info on integration exam (new link), I want to be Dutch (Currently only in Dutch) *Laws governing Dutch citizenship as of October 10, 2010. Portugal – Portuguese nationality (in English), Portuguese citizenship (in Portuguese), Acquisition of Portuguese nationality by children, Nationality acquisition by the Portuguese, Who can acquire Portuguese nationality? Also consult with the Portuguese consulate/embassy in nearest you. *There are restrictions on citizens from Romania and Bulgaria in 13 EU member states. The EU will make an official announcement when these restrictions are lifted. **Croatia joined the EU on July 1, 2013 and there are restrictions on free movement of its citizens in the majority of member states until 2015/2018/2020 (2+3+2 rule). The following countries are technically non-EU countries, however they all have bilateral agreements with the EU that allow their citizens the right of movement, residence and employment in the EU member states. * All questions should be directed at the respective consulate or embassy in your homeland, where personnel are authorized to dispense official advice and accept citizenship applications. Please note my copyright policy and be aware that plagiarism and copyright violations will be pursued. hello : if a daughter of european citizenship of a country of schengen needs to stay in europe with a resident permit cause she didn’t take the citizenship cause of the bureaucracy (changing rule every time unfortunately) what can she do? when applying in the consulate (the consulate said this is not our work, this the work of municipality of our country : then in this schengen country, they said u should took from embassy !!!!!! so is there any rule for daughter of european citizenship (schengen county ) right to took this residence visa !! even she is married and up to 18 years old !!! who and what is the step that should be take it !!!!! If you do not have EU citizenship, you must get a residence permit. There is no such thing as a residence visa in Greece. If you would like to apply for EU citizenship through an ancestor/relative born in an EU country, you must apply at the appropriate ancestor’s consulate or embassy in the country you now live. For example, if you live in Greece and your ancestor is from Germany, you apply at the German Consulate/Embassy in Greece for German citizenship. If applying for EU citizenship is not an option or too difficult for you, you must get a residence permit if you are a non-EU citizen. This is accomplished by going to the municipality office where you live. If you are married to an EU citizen, you still need a residence permit and still need to go to the municipality. If you are the child of an EU citizen, you still need a residence permit if you yourself are a non-EU citizen. Please search more carefully next time, and best of luck to you. how to get eu passport if american? As stated above, you need to meet the requirements and be granted citizenship from an EU member state in order to qualify for an EU passport. Was very much enjoying the informative content of your site when I discovered some dead-end links (error 404: file not found). On the portion discussing getting permission to work/live in Greece by acquiring EU citizenship (via ancestral connection to an EU country), I found that the links for the German official sites no longer work. Just wanted to bring that to the attention of your site manager. Thanks again for such a quality site. It’s the most helpful one I’ve found yet! I last checked links on February 13, 2011, as indicated above. However, “official” websites have a habit of changing, either due to a revamp or a change in government, without leaving old links in place, so I’ll put this on my to-do list and scout out some new ones. Thank you for letting me know and for your kind words. Thanks to this site, I was inspired to acquire my German citizenship so I could come work in beautiful Greece. I hadn’t thought it was an option for me as a U.S. citizen, but I learned that since my mother was a German citizen at the time of my birth, I was indeed eligible. Kat’s site has been invaluable to me while I have been working and playing in Greece. I really appreciate all the time and care she takes to update and keep information current – it seems like maintaining this site could be a full-time job! From one Kat to another…. Thanks a million – my time in Greece has been nothing less than life-changing. You’re right. This could be a full-time job and I have ideas that can further enrich this project, but I have a career that crosses borders and time zones. I appreciate you taking the time to seek me out on Twitter and come back to the website to tell me how it helped you. In “Should I move to Greece?“, I say that I and this website can assist in making dreams come true and I’m glad to hear it’s happening. Most of the time people accuse me of being negative or having an ulterior agenda, but my work has always been out of love for Greece. It’s very easy to help people like you, not to mention a pleasure to meet you. If you click the link I provide for Italy and switch to English, it says you can automatically be an Italian citizen if your parents were born in Italy or you can stake a claim through a second-generation ancestor under certain conditions, which would be your grandparents. It says nothing about great grandparents. You are free to verify my answer at the Italian embassy/consulate nearest your residence. If your father was born in the UK and had UK citizenship, you could stake a claim through him. I’m guessing he didn’t since you say he had a permanent stay permit; that’s not even close to being the same thing. As you are not related by blood to his last wife, she is not your ancestor and you cannot stake a claim to anything through her. Again, you are free to verify my answer at the UK embassy/consulate nearest your residence or read through the ample resources via links I provided above for the UK. My girlfriends grandfather was born in Germany and moved to Australia where he married her grandmother (an Australian woman). Their son, my girlfriends dad, and mum were both born in Australia, and so was my girlfriend. Her German born grandfather has now passed away. Would their be any possibility of obtaining a German passport through this link? I get the feeling you didn’t read the article or click the links. — As I say in the article above, you need to have citizenship from an EU country before applying for a passport. Can you get a passport through the link? No. — If you had clicked either of the links for Germany and read the documentation, it says that having a German ancestor in itself is not enough to qualify, plus Germany only recognizes citizenship through ancestry via parents born in Germany, not grandparents. The information cannot help you unless you help yourself. There’s no way I or anyone can answer your question based on the little information you gave. The procedure in claiming citizenship in Austria is very different than the Czech Republic and involves a lot of documentation. You need to follow the links I gave above to learn more and contact the Austrian and Czech embassies/consulates closest to your current place of residence if you have questions. I am looking at applying for an EU visa through my maternal grandfather, unfortunately his birth and death certificates have been lost so I am unsure how to go about obtaining this information so I am able to apply for the visa. What are the exact requirements for this visa so that I may start the process of obtaining necessary records and paperwork as soon as possible? There is no such thing as an EU visa. As it says above, each country retains its separate borders and laws on what’s required in granting visas and citizenship, since Europe is a continent and has not fused into a single entity. This is why the list is organized by country. Explore the links or call the relevant consulate/embassy handling matters pertaining to your grandfather’s country of origin. The information cannot help you if you do not help yourself. I am writing in reply to Kat’s reply who said she was inspired to apply for her German Citizenship to work in Greece? I have applied for my German Citizenship through the process of staatsangehoerigkeit and have lodged it at my German Consulate here in Sydney Australia. I was wondering Kat if you knew how long this would take or how long yours took as it has been 4months and I am getting ‘itchy feet’ now waiting to go! I asked Kat to check in, which she kindly obliged below, but I want to mention separately that a person’s processing time is unique to their case, so whatever happened in Kat’s case doesn’t necessarily apply to you. You applied in different countries at different consulates, and there was likely a different number of staff and applications in the queue, and there is not generally anything you can do to make the process go faster. Just something to keep in mind. Hi Chris! I paid extra to have the passport expedited, so from beginning to end it was less than a month for me. This also included having to battle a bit with what was “satisfactory” to them (but only for a few days). Are you expecting them to ship the passport to you, or are you picking it up at the consulate? From what I understood (but I could have been given the wrong information), the passport comes from Germany and the consulate in the US couldn’t give me the exact time it would arrive. Not sure why you are having to wait so long! Have you tried to contact them again to see if you are missing a piece of information? Hi Kat & Kat, thanks for your speedy replies! How efficient you all are! Yes what I am expecting them to provide me with is a German Citizenship Certificate which they have said that I will be able to pick up at the Sydney Consulate. How do you mean you had it expedited? What were the costs involved with this? I have been told that there “is no way to speed up the process” in those words from the German Consulate. Yes all the processing is taking place in Cologne in Germany and I have to sit and wait apparently? I have received a confirmation of receipt for my Application in Cologne and asked is there any furthering I can do on my part but again been told to just wait. I guess I am not sure what you mean by “German Citizenship Certificate” – what I applied for was a passport. I used the links Kat has provided above for basic information and also corresponded with the German consulate in my state before I applied. I think the costs for me would be irrelevant for you since you are in a different country. If you click through the links on the pages above to find info about the Australian German consulate, you can find information about the price and process of getting a German passport. I don’t recall getting any confirmation from Cologne, or even from the consulate itself. I called and they said yes, the information you gave us was enough, and then I had to wait. I think I did call and find out that the passport had been processed, but they couldn’t give me any tracking information. From what I understood, they were waiting for other documents/passports from Germany to arrive – they didn’t send out the passports one by one. Before applying for a German passport, were you required to go through a process to claim German citizenship via your mother? Or were you considered to already have it. I think what Chris was required to do was stake a formal claim through an ancestor, though he does not say which one, and get a certificate; and he’s under the impression you did the same thing. Yes maybe we have applied similarly but different none the same unfortunately!? Yes I was under the impression you did the same thing. I am claiming through my German Grandfather as pre 1975 only the male bloodline counts in German Law. My Mother inherited German Ancestry through being born through her German Parents. They were not Naturalized Australians till 6years after her birth. My Mother never acquired German Citizenship, thus I am inherently claiming through my German Grandfather. This obviously is different but I knew a German family friend who did the same who said it didn’t take long yet 4months later I am still waiting. I guess I will just have to sit and wait or simply just visit for a short amount of time. Anyway thankyou all for your help hopefully my posts will help someone else enquiring? Kat if you wish to put some good info up on your website for German Citizenship by Decent check out something called “staatsangehoerigkeit”, the best English translation of this process can be found on the London German Consulate website. As I said in my original comment, each case is unique and should be treated that way. I don’t have specific experience with German citizenship, but Greek citizenship cases that typically extend processing time are: a) claiming through a grandparent; b) parent was not born in the relevant country either and did not stake a claim; c) submitting papers through a consulate/embassy. All three of those things apply in your case. Not saying it will make you feel better, but a man I know claimed through a Greek grandparent and had to wait 2 years and 8 months before his citizenship was processed. There were no problems with his papers; that’s just how long it took. Germany is far more efficient, so be patient. Four months is not a long time. Thank you for the tip. I’ll check it out. Ah, I see – my mother was a German citizen at the time of my birth, so I think it was easier for me to make my claim. I didn’t have to go through any process before my appointment at the consulate, I just had to provide her birth certificate and marriage certificate, as well as my birth certificate. With that, it was fairly straightforward to get a passport, but your situation sounds a bit different.